FULL NAME: Managing Frailty. A comprehensive approach to promote a disability-free advanced age in Europe: the ADVANTAGE initiative. CALL FOR THE TENDER PROJECT: The European Joint Action on Frailty Prevention is framed within the Third EU health programme (2014-2020). NEWSLETTER: Download the second newsletter of the project. Clic here. DESCRIPTION: The European population is expected to suffer a drastic change in the following decades with a higher ratio of elderly people. This demographic change will imply a growing demand in health and social care due to the load from chronic illnesses, frailty, disabilities and advanced age, making this demand a central priority for the European Union (EU) and its Member States (MS). 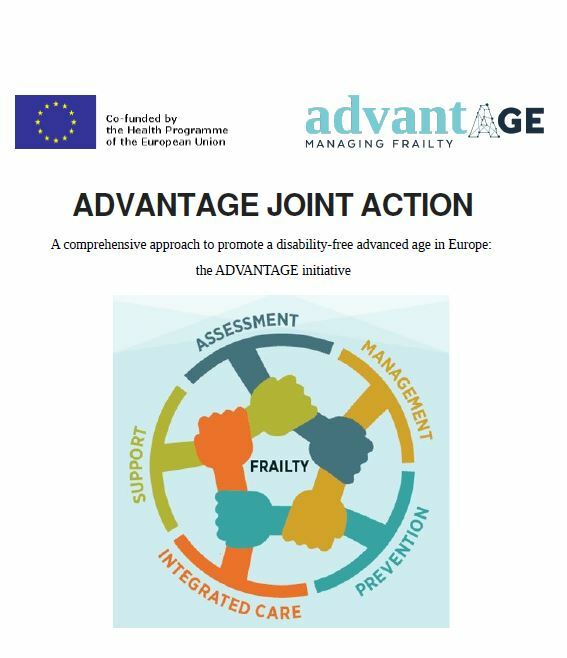 The ADVANTAGE project seeks to build a shared knowledge on frailty that must be used by all the MS as a shared focus in the management of elderly people who are frail or are at risk of becoming frail within the EU. The identification of the basic components of frailty and its management must promote the necessary changes in the organisation and implementation of Health and Social Care Systems, providing them with the care models that would allow them to face the challenge of frailty within a shared framework, based on the specific health care profile of each MS. This project shall also summarise the current state-of-the-art of the different frailty components and their management on both an individual and a collective level; gathering information on the development of programmes for frailty management in the elderly population in the EU; and last of all, it shall propose, as its main result, a shared European model to address frailty, focusing on the development of improved strategies for the diagnosis, care and education in terms of frailty, disability and multi-morbidity. PROJECT AIMS: The main aim of the project is the development of the concept of “Addressing Frailty Prevention” in health and social care services, encouraging consensus to create a shared understanding on frailty that will be used by the MS. The purpose is to obtain a shared focus for the management of elderly people who are frail or are at risk of developing frailty in the EU. ADRESSED TO: Elderly people who are frail or are at risk of developing frailty, disabilities and multi-morbidity. WORK METHODOLOGY: In general terms, we foresee three main phases that correspond to three aims of the Joint Action. Phase I (M1 to M12): collection of background information, analysis, rational discussion and drafting using the information from preliminary documents. Phase II (M13 to M24): development and testing of the draft focusing on frailty prevention (FPA). Phase III (M25 to M36): drafting of final documents, debate among participating MS and drafting of the final framework and the roadmap for the FPA. The ADVANTAGE project contributes to the reduction of disabilities and dependency and avoids growing health demands due to the increase of the load of chronic illnesses. It will also help to provide a more efficient response to the needs of elderly people when providing care, including gender-susceptible aspects, through a better planning and coordination of care, an innovative organisational focus and a better collaboration between professional and informal caregivers, including self-management support. Role of Kronikgune in the project: Kronikgune will lead the “Knowledge” task of the Work Package 2 (WP2), which has the purpose of disseminating information on the challenge of frailty and disability and raising awareness while promoting frailty prevention and management. It will also participate in the tasks related to Work Package 4 (WP4). And lead the task “Information and Communications Technology (ICT)”, within work package 6, that pursues the purpose of analysing existing ICT tools and applications for the prevention, detection, diagnosis, treatment and / or control of frailty in clinical practice. Last of all, within work package 7, it will lead the task “Analysis and lessons learned from the established integrated care models” to analyse how the integrated care models are being implemented and assessing the impact of the interventions. Role of Osakidetza in the project: Osakidetza participates in this project as an affiliate entity, linked to Kronikgune, and will collaborate in the same tasks that have been assigned to Kronikgune. Coordination: Olatz Albaina Bacaicoa; Danika Schepis; Ane Fullaondo Zabala; Esteban de Manuel Keenoy. Evaluation: Antonio de Blas; Marbella Garcia; Javier Mar; Mari Luz Peña; Mari Carmen Rodriguez; Arantza Uranga; Itziar Vergara; Jon Zugazagoitia.